ALL grades are now considered high risk years in Florida. In the POLITICO Florida article, “Parents fight Remediation Amid Testing Debacle (Sept 15 2016),” many students in Florida faced both threatened and actual remediation, even with a satisfactory report card for the previous year. Parents can deny remediation, but only if you are fully informed and willing to stand up for it. This is not information that will be volunteered to you. From a previous post: Parents You are the BOSS, and you can say NO. The grades that face the harshest consequences for failing the FSA are the Third and Tenth grades; Third grade because of mandatory retention and Tenth grade because of denial of graduation. This post will address only the Third Grade. The basis for this post refers to our experience with opting out and experiences shared with The Opt Out Florida Network and is in no way intended to be interpreted as legal advice. If you need legal advice, please seek proper counsel from an attorney. The most important sections of the statute pertaining to the third grade are highlighted in yellow. 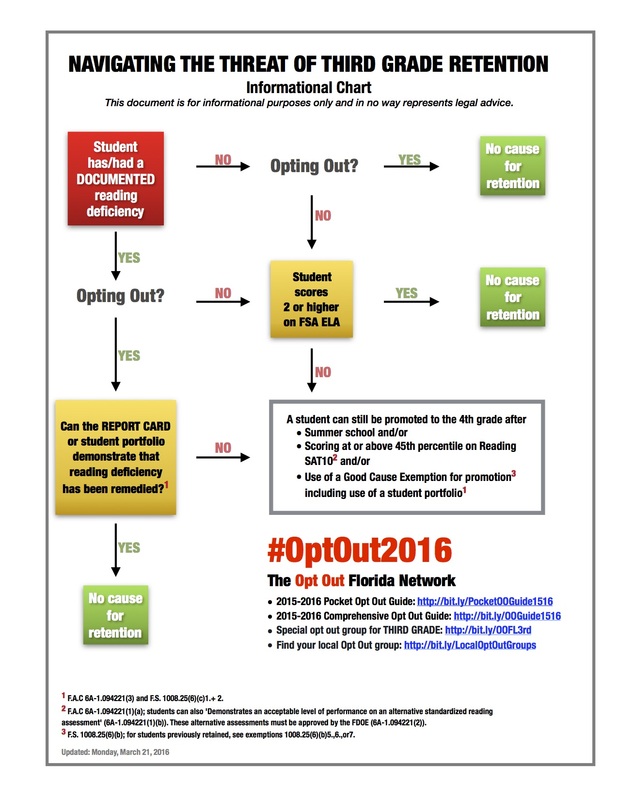 This year, Opt Out groups are exploding all over Florida, but most especially Opt Out Third Grade Florida. Many parents turn to opt out groups after their child has been harmed, or is being harmed by testing. They don’t know what to do; they just know that they “have to do something.” Their child may have been unnecessarily retained, remediated, excessively tested, shamed for lack of performance, had recess denied, developed anxiety, started wetting the bed, started having nightmares, are now unable to sleep through the night, and on and on and on. These are real issues for children and their families. And a root cause of the issues is often in high stakes testing. It is where the children test monthly, weekly and even daily. These are not spelling tests, chapter tests, quizzes, projects; they are not assessments created by the teacher, for your child. Children are now incessantly “progress monitored,” even in Kindergarten. They take iReady, Accelerated Reader, Successmaker, Achieve 3000, Discovery Ed, the IOWA, to name a few. Kids take LOTS of tests. Here is the Pocket Opt Out Guide for 15-16, which should be enough for almost everyone, but in case you need more guidance for Third Grade, keep reading. It is possible that the only thing needed is a satisfactory report card. Many children have been so promoted in the past three years since the opt out movement started in Florida. Some parents want to make a statement by opting out. Ultimately, the most successful opt out is one that is the least disruptive to the school and is as easy as possible on the child. There is NO NEED to send an Opt Out letter. Your student can refuse the test and sit quietly or you can pick them up. Putting the school on notice with an early letter opens the door to idle threats and bully letters. Many parents keep their kids home on day 1 of testing. Kids WILL be given the make up test on their return. They can then refuse and be sent back to class to get on with learning. Some feel this is the least disruptive way to opt out. (We have heard of more recent cases where kids were not allowed to go back to class until the end of the allotted testing time. Check with your school for the makeup dates. We have heard of some schools keeping kids in testing for the duration of testing time after they have refused. This is unusual. This involves keeping a child out of school for up to two weeks. This is not advised. When parents are told to keep kids home during testing, they are essentially denying your child the right to their education. If parents still choose to go this route, they can get creative and schedule all the necessary appointments during this time – dentist, check ups, eye exams, etc. a) simply listen to the teacher or test administrator read the Test Rules Acknowledgement. It is a personal decision whether or not to sign this. This is the pledge that the student will share no information with anyone...or their test will be invalidated. Agreements signed by minor children without parental consent are not legally binding anyway, so why sign it? b) They will then be instructed to open their test (break the seal). They MUST do this. Opening the test assures that they will not be given the make up test later on. c) They will be told to begin. They may push the test away and put their pencil down. No student opting out should be badgered, prompted, or pushed to start the test once they have indicated that they will not do so. That’s IT. Done. They have now “participated” in the process, but more importantly, they have also “opted out” of providing any data to the state via the FSA. Being told repeatedly to begin their test, after they have politely declined could be considered coercion, intimidation or harassment and could be grounds for a formal ethics complaint against the test administrator, proctor and/or school. – You will need to ask what time testing will begin so that you can go to the office and sign out your child a little AFTER testing has begun. After your child breaks the seal and pushes the test away, they SHOULD be allowed to leave the room if you request them in person and return them when class resumes. – A school may not lawfully deny a parent access to their child, on demand, unless there is a real security lockdown, a restraining order or a custodial agreement barring parental pick up. Districts are allowed (by the FDOE) to have a policy that (after your child breaks the seal, signs test, and turns it in) allows students to read the rest of the time. (FSA manual p. 34: “You may allow students to read after they have finished a session AND their test materials have been collected.“) www.fsassessments.org Many districts have not exercised this option, but parents should demand it. Public school board meetings would be a good venue to address this issue. EVERY PARENT OF A CHILD IN THE THIRD GRADE should establish a “paper trail” by e-mailing their child’s teacher with cc: to principal. This should be done now. No need to add anything else or to give a reason for asking. It’s your child. If your child has no deficiency, this will strengthen you position against retention, should the need arise. And if a child is deficient, parents need to know – and on what basis. It may not be an actual deficiency, but one based on test performance. You can’t question anything if you don’t know what the school has, and you can’t support your child fully, if you are unaware that a real deficiency exists. In this case, ignorance is NOT bliss. If your child has an actual reading deficiency, you should have been notified IN WRITING, usually (but not always) by Winter break (Being notified of a reading deficiency as soon as you have notified the school of your intention to opt out would raise suspicions in this parent’s mind). You would have had a meeting scheduled where you would have signed off and approved interventions, which should now be in place. If this did not happen, chances are very slim that your child has an actual reading deficiency and the school will have a very hard time trying to retain your child, FSA score or not. Please see this flowchart below. It is in no way legal advice, but will simplify understanding the threat of Third Grade retention. IF your child does have a reading deficiency, that is even more reason NOT to allow your child to take the FSA. A failing score WILL flag them for retention. It will still be possible to avoid retention, but it will be more challenging. Some schools use assessments like iReady or Achieve 3000, or a number of other online assessments, even AR (Accelerated Reader). You can also opt out of these, if you wish. They are not mandated by law. I am not exaggerating when I say that, if you do opt out of these “online progress monitoring” assessments, your child may have little else to do in school these days, so be prepared to send books, for your child to read. If the school says that your child has a reading deficiency based on these assessments, what do the report card and progress report say? If your child has a satisfactory progress report and report card, it will be pretty impossible for them to retain your child without your written consent. EVEN IF your child does have a reading deficiency, you CAN push for promotion AND ALSO make sure that a complete evaluation is done to identify the reading deficiency so that proper interventions will be in place for the fourth grade. The bottom line is that NO child may be retained or remediated on the sole basis of a single FSA test score, or the lack of an FSA score. The LAW is very clear. My daughter is in IEP program she is in 3 rd grade, she has the Mc Kay schoolarship and she is 9 years old. If we do the opt out is any possibility that the school kick her out from the school? And if they kick her out is a possibility that she lose the schoolarship? Time isn’t running and we are worry everyday. Please help!